School is out and it's hot outside, so that means it's time for ice cream! Gather the kids, make homemade ice cream (try my recipes for nectarine ice cream, raspberry ice cream, and "lazzberry" ice cream! 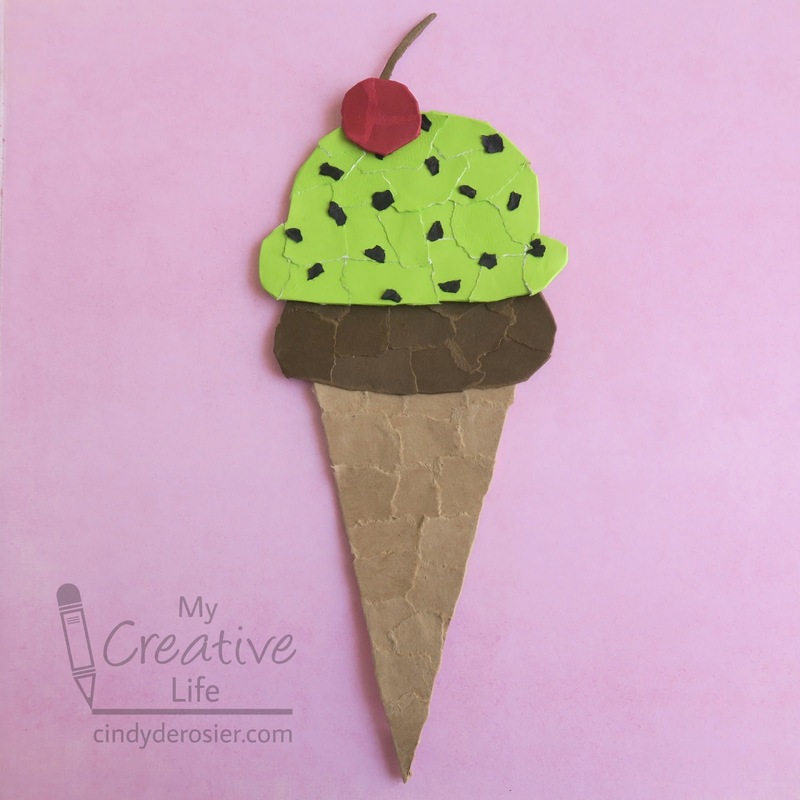 ), and then create this fun mosaic craft while the ice cream is freezing. 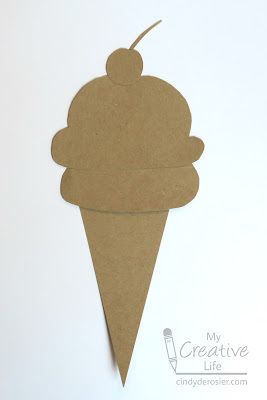 Cut the chipboard to make an ice cream cone. Each portion (cone, scoops, cherry, stem) should be a separate piece. Here are mine, assembled as they'll look for the finished project. Begin with the cone. Tear tan construction paper into small pieces (mine are about 1/2" square) and glue them to the base, overlapping the pieces slightly. 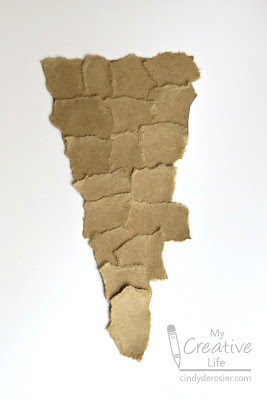 It doesn't matter if any pieces hang over the edge. 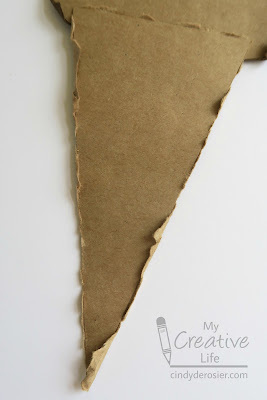 Turn the cone over and fold back any overhanging pieces. There's no need to glue them down or trim them unless you want to. Make the ice cream scoops the same way. 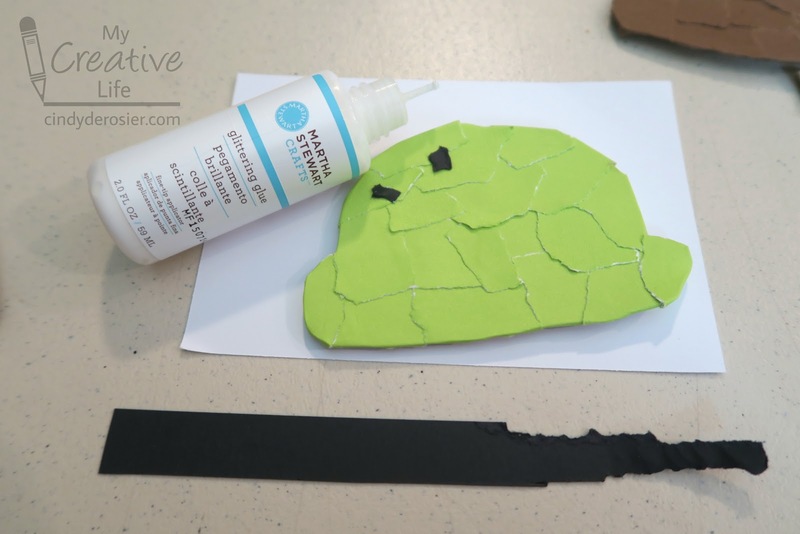 Tear construction paper, glue it down, then fold back the overhanging section. 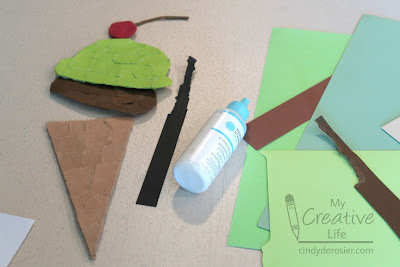 To make mint chip (or other flavors with mix-ins), just add tiny bits of torn construction paper in the appropriate color. I used the same mosaic technique for the cherry, but just covered the stem with a sliver of construction paper. It's way too small for mosaic bits. Glue all the pieces together and you have your finished cone! If your timing is similar to mine, your homemade ice cream should be ready to eat right around now. Enjoy! And if you make lazzberry ice cream, be sure to let me know so I can pass it along to Trevor. He's very proud of his creation. As he should be - it's delicious!! Hi Cindy! Yes, it's definitely getting hot here. Anne's freshman year of high school just ended yesterday. And I have one more week of school (I worked as a part time school nurse this past year!) left. I absolutely love your fun and fabulous mosaic ice cream cone. I need to try your ice cream recipes, too! This is soooooooooooo fun! I love it!!!!!!!!!! Yum! This is soooooo cute!